Not even Storm Doris could prevent me from attending the CloudCamp event, organised by Cohesive Networks and also sponsored by VMware Code. Due to major travel restrictions and no tubes, I wasn’t expecting the turn out to be high but surprisingly, it was a full-house soon after it started, much to the delight of Joe Baguley as pizzas were ordered expecting 140 attendees. Alex Tijhuis: Stuff data legislation – it’s time for the real information era! Mark Craddock: What does Brexit mean for G-Cloud? As you can tell, it was all about the impact of the changing data protection landscape and the laws, especially after Brexit. How all of this will affect your business but also how it covers the people you do business with too. The talks were fascinating and it was great to hear about the definitions of what a business is responsible for protecting, whether it’s the data itself or the infrastructure it’s traversing. It was also good to hear about how much the law covers and how liability changes, depending on where it is. Prime focus of the discussion was the new General Data Protection Regulation (GDPR). If you haven’t heard about it before, you are not alone. To paraphrase Adrian Colyer, this is the law that you may not know anything about. However, this does not relieve you from your responsibilities of data protection and if you have your business locations in Europe or you have business relationships within Europe (be it with a supplier or customer), you need to know about it as time is ticking and you have to be compliant. Goes without saying that it did generate a fair amount of queries and discussion. For that reason, Joe decided to make an exception this time and the “Unpanel” was formed with the speakers, instead of members of the audience. The questions and answers continued and were very insightful. I just wish we could record all the talks and following discussions. That said, I think the moral of the story is that if you haven’t given much thought to GDPR and impact of Brexit on your data protection practices, you should find out all about it and ensure your company acts on whatever is required to make the company compliant. As always, it was pizza and drinks time thereafter. Discussions continued long afterwards. Ant Stanley, Julian Wood, Greg Ferro (you may know him as @EtherealMind) and I had a very varied conversation which started with vendors but then went into cloud, networking, datacenters and all sorts. Very jealous that their conversation continued after in a pub somewhere while I had to leave for home – to be stuck for the next few hours at Euston with cancelling trains! 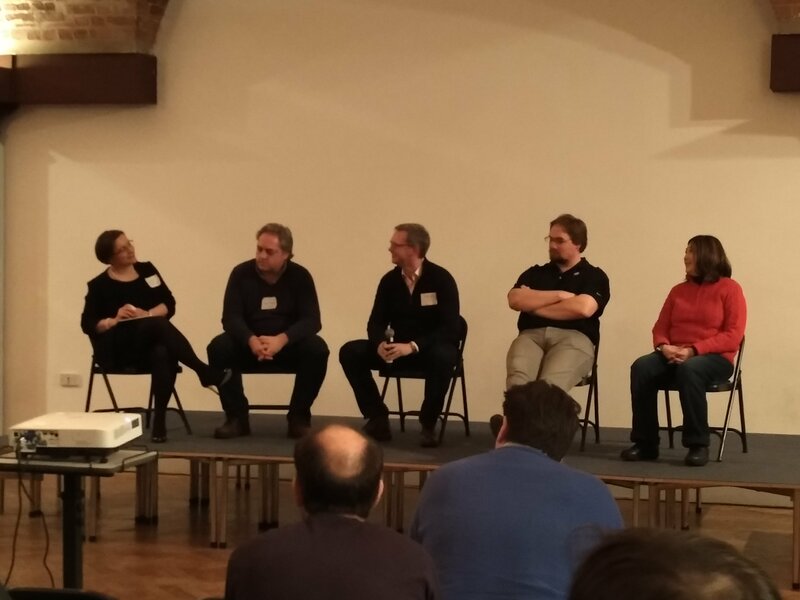 If you still don’t know what CloudCamp is and when to attend, you must come to it as this is a fun and informal event and yet, jam-packed with lots of great information and discussion. So, hope to see you next time! [Quick Mention] There is a new event starting called Map Camp. Its first event is on 5th October 2017. They’re looking for volunteers so if you are interested, here is the link to register.